I was 18 years old, and my plane from Germany had just landed in Washington, DC. It was a hot, humid June day in 1963 and I was on my way to visit my aunt for a couple weeks before reporting to West Point to begin "Beast Barracks" summer training. My plan was to use this interlude to explore the capitol. One day before heading into the city I was browsing my aunt's bookshelf. 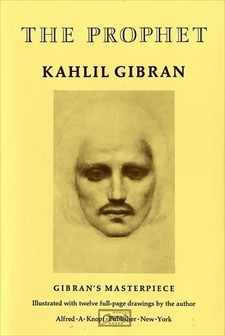 I noticed a strange little book entitled, The Prophet, by poet-artist Kahlil Gibran. It was a curious mixture of inspirational prose and poetry. I was intrigued because what the author said resonated within me, even though I was too young to understand why. Aside from The Holy Bible, it was my first high-octane encounter with wisdom - at a time when I really needed it! When my aunt noticed that I was absorbed in the book, she gave it to me. I have been on a journey in search of more wisdom ever since. Kahlil Gibran was born in Lebanon in 1883. He immigrated with his family and studied art. The Prophet was first published in 1923, and was a best-seller in the 1960s. It remains in print to this day - one of the best-selling books of poetry of all time, exceeded only by Shakespeare and Lao-Tsu. Gibran died in 1931. I didn't know then, of course, that most of what he was writing about was personal strength - how to live the kind of life that enables you to meet the challenges of life and work. COMPASSION - "Tenderness and kindness are not signs of weakness and despair, but manifestations of strength and resolution." FAITH - "Faith is an oasis in the heart which will never be reached by the caravan of thinking." FRIENDSHIP - "Let your best be for your friend." INTEGRITY - "One may not reach the dawn save by the path of the night." LOVE - "If you love somebody, let them go, for if they return, they were always yours. And if they don't, they never were." RESPONSIBILITY - "We choose our joys and sorrows long before we experience them." SELF-DEVELOPMENT - "Perplexity is the beginning of knowledge." In 1975 (when I was 18, as it turns out), I decided to do a centennial piece of needlework, something reminiscent of older days.I chose the text of Gibran's Friendship saying. I worked the sampler using navy, maroon and gold silk twist on linen. It took me two years to complete and my father had it framed for me. It hangs on the landing in my home now some 35 years later. I think I'll go buy a copy of the book. I don't own one any more. Thanks for bringing Gibran more fully to the front of my mind. "In the dew of little things, the heart finds its morning and is refreshed." Rosa, what a lovely story! Thanks for sharing it, and for the quote, which I just now added to my collection. Anyone who appreciates Gibran is a sensitive soul. For Gibran does indeed stir the Soul. "The archer sees the mark upon the path of the infinite, and he bends you with his might that the arrows may go swift and far. Let your bending in the archer's hand be for gladness; For even as he loves the arrow that flies, so he loves the bow that is stable"